The liturgical tradition in many of the western Christian churches invites worshipping communities to include the washing of feet as part of their Maundy Thursday worship. As the gospel according to John (13:3-16) tells us, Jesus washed the feet of his disciples in the upper room after they had shared a meal together in which the bread and wine had been blessed, broken and shared. Many reformation churches reintroduced the washing of feet following liturgical renewals from the Second Vatican Council of the Roman Catholic Church of the mid 1960s. There is another form of servant ministry teaching that is also a good fit with Maundy Thursday worship — the washing and drying of dirty clothes. “Laundry Love,” a ministry begun in an Episcopal congregation in Ventura, CA, has inspired Episcopal communities around the country to include a local laundromat-based ministry as an important aspect for either community ministry or worship on Maundy Thursday. 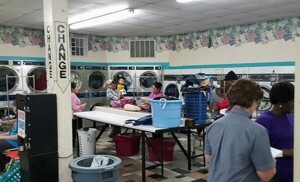 Imagine that…celebrating Maundy Thursday in a community laundromat by making use of the Laundry Love format. 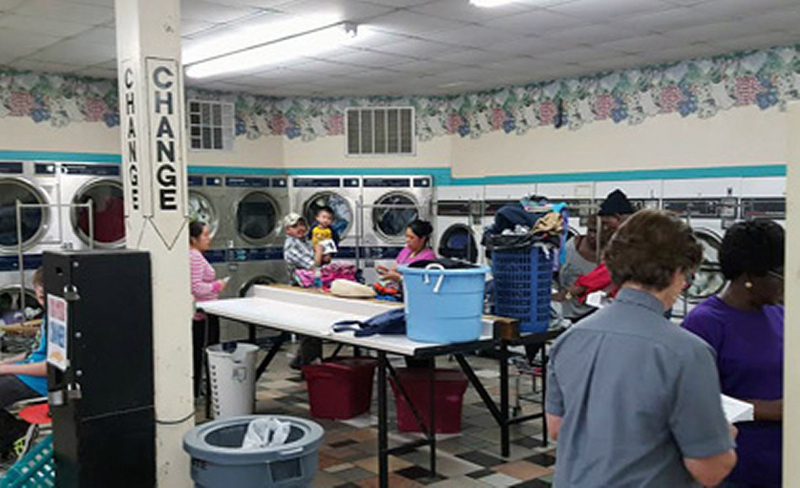 In 2016, Trinity Episcopal Church in Clanton, AL, a parish of about 85 members, celebrated Maundy Thursday at the Suds-R-Us laundromat after having begun a Laundry Love ministry on a quarterly basis in 2015. 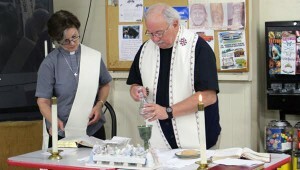 After reading a news release about St. Stephen’s Episcopal Church in Pittsfield, MA initiating a ministry named “Maundy Laundry” on Maundy Thursday, the Trinity parish altar guild director and coordinator for the parish Laundry Love ministry recommended that the parish go a step further. She suggested that the parish actually conduct the Maundy Thursday worship at the local Suds-R-Us laundromat rather than in the church nave. “Why not!” was the parish echo cry. The Trinity Church “Free Laundry from 4:00–7:00 pm” sign was set up in front of Suds-R-Us at 8:00 am on Maundy Thursday. At 3:00, 25 folding chairs, a portable keyboard for the church musician, and a small table to serve as an altar arrived at the laundromat. Beginning at 4:00, everyone coming into the laundromat with dirty clothes was informed that the washing and drying of their clothes would be free that day. 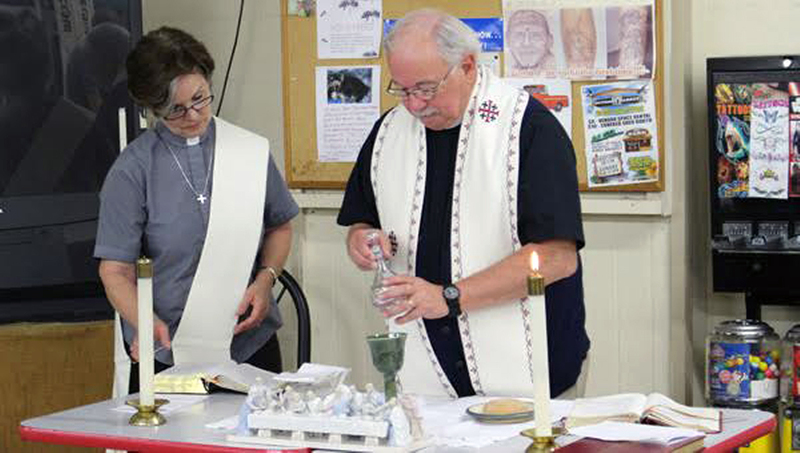 Around 5:30, the parish altar guild coordinator and the parish deacon set up the candles, a Book of Common Prayer and a chalice and paten for the bread and wine. Shortly after, members of Trinity began arriving for the Maundy Thursday service. Bulletins were distributed throughout the laundromat and all were invited to come sit for the worship service or to listen in if they were more comfortable continuing to do their laundry. The worship was informal but very moving. Familiar hymns like “Shall we gather at the river” and “Amazing Grace,” plus a Taize chant “Jesus remember me,” were sung during the service. Scripture readings were read so that all in the laundromat could hear. The gospel was read by the deacon as she walked around the laundromat. The sermon was preached by the rector as he also walked around the laundromat telling everyone that the washing of clothes was a gift of love and an act of hopefulness for a better time yet to come. The prayers of the people included a prayer for those who had come to have their clothes washed and dried. And when it was time to share Holy Communion, both blessed bread and wine were shared not only with those seated around the altar but with every single person doing their laundry or folding their clean clothes. Every person in the laundromat received Holy Communion that evening. No one was ignored and no one refused to receive the gift of Holy Communion. Many of the members of Trinity who attended the Maundy Thursday service at the laundromat later commented that it was the most meaningful and moving worship service they had ever experienced. They also expressed the hope that the parish would again offer the Maundy Thursday service in the laundromat in 2017. Following the completion of the service, some of the members of Trinity returned to the church for the stripping of the altar and preparations for Good Friday, while others remained at the laundromat to offer assistance to those still coming in to wash and dry their clothes. Bob Dylan tells us, “The times they are a changin’….” Yes, they are changing as we seek to embrace new church designs based upon the ancient foundational teachings of Jesus. About the author: William King has served as a priest in the Episcopal Diocese of Alabama for the past 30 years and recently retired as rector of Trinity Episcopal Church, Clanton, AL. He now serves as the “Bishop’s Chaplain for retired clergy, spouses and widows” residing in the Diocese of Alabama.